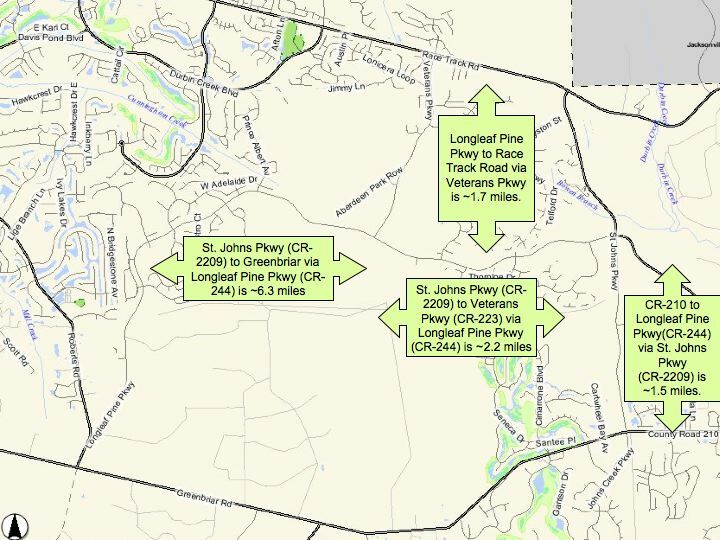 The map below is a snapshot of the "new" roads in NW St. Johns county west of I-95. These roads are in really good shape except when some of the new construction debris gets into the road way and have relatively light traffic. For more information, visit the St. Johns County GIS iMap application here. St. Johns Pkwy (CR-2209) meets up with CR-210 near the Publix shopping center. St. Johns Pkwy (CR-2209) meets up with Racetrack road where Russel Sampson used to. Longleaf Pine Pkwy (CR-244) hooks up to Greenbriar and Roberts Road on the west end and St. Johns Pkwy (CR-2209) on the east end. Veterans Pkwy (CR-223) hooks up with Racetrack Road about a mile east of the Durbin Creek, Bishop Estates Road and Racetrack road intersection. If you have any question, please post them in the forums.